55 Series Shell Case with End Panel - New DEEP Top Version, No batt. 4.94 x 2.75 x 1.27"
55 Series Shell Case with End Panel - New DEEP Top Version, 9-volt batt. 55 Series Shell Case with End Panel - New DEEP Top Version, 4 AA batt. 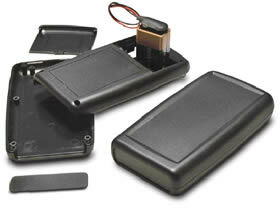 55 Series Shell Case with End Panel - New DEEP Top Version, 2 AA batt. 55 Series Deep Top End Plate. Pack of ten.